Salvation Army Echelon, the official young adult auxiliary of The Salvation Army, is the product of an idea that began in Dallas, Texas in 2010. 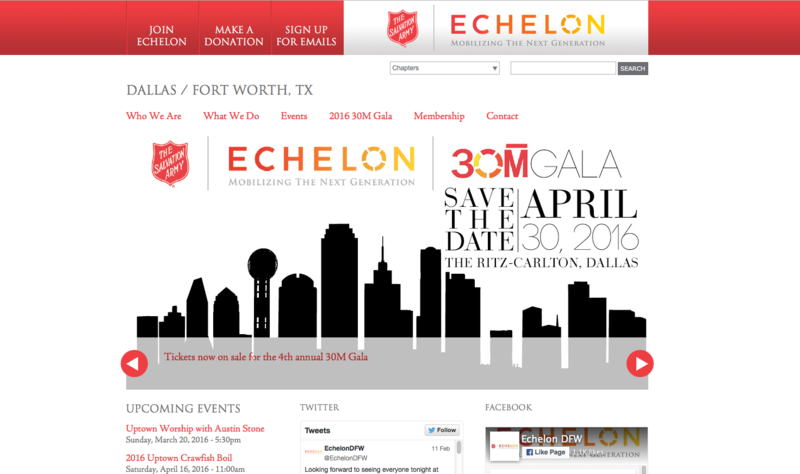 Echelon is the next generation of community action for the Salvation Army. Men and women age 21 to 35 engage in networking, fundraising and community service in chapters across the U.S.
After the network of chapters expanded from one club in Dallas to several clubs across the nation, Salvation Army Echelon wanted a solution to house the chapters under one umbrella while allowing each club to customize their own site. They chose Skvare based on their expertise in CiviCRM and the added benefit of having all web-related services - web development, hosting and maintenance - provided by one company. The problem with each chapter using a different event management service came in the form of additional overhead costs and administration of disparate systems, including non-uniform user experience, data collection and payment processing. Implementing CiviEvent and other CiviCRM features streamlines the process while unifying the look and logistics of all the chapter websites. “Another feature that I'm excited about expanding our use of is the calendar. It will be very beneficial to have all of our meetings, events, volunteer opportunities listed in one central location where everyone can reference it." To learn more about this project or other CiviCRM solutions, please visit Skvare. A challenge that many membership-based organizations face is to set up chapter contacts in a way that one chapter administrator can only edit local contacts and not send out a newsletter to the wrong group of contacts or delete members from other chapters. Skvare used the power of CiviCRM and Drupal to set detailed roles and permissions, grouped contacts based on chapter membership and refactored the ACL’s (Access Control Lists) to segment the access, editing, and deletion of chapter-specific contacts. The chapter administrators have limited technical training, and this solution was the first step to allowing access and ownership for each chapter’s data. Another challenge Skvare addressed was to provide members a discount with event registration. That functionality already exists within the CiviDiscount extension, however, the local chapter members do not have passwords or accounts set up on the site. The standard option is to provide an event registration link with a discounted ticket price, or force the members to go through an account setup process. Skvare delivered a custom solution using Drupal’s CiviCRM Webform integration that allows members to input their name and email into a short form prior to registration. After membership is verified, the user is automatically re-directed to a pre-filled event registration page with the member discount applied - all in one simple step for the registering members, while providing options to join for the non-members. Each Salvation Army Echelon chapter can select from a collection of standard reports that are available to all the chapters. Though the queries are shared, the reports are configured to only display results for the local chapter. The permissions set allow each chapter administrator access to summaries and granular data of their membership, event registrations and donations. This protects member data from other locations but provides a predictable, repeatable process across chapters, saving time and overhead costs. 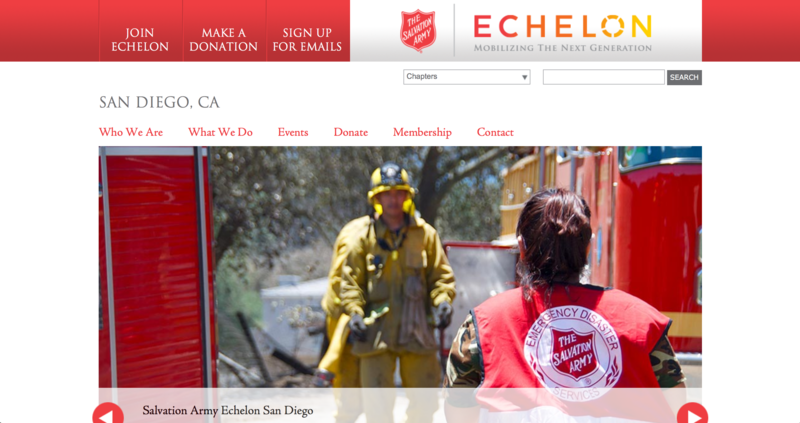 One of the primary goals for Echelon was to give each chapter the ability to share unique content in a sophisticated and accessible way while keeping the Salvation Army branding consistent throughout. It was important to make website changes simple for chapter members who have minimal technical experience. show a calendar of events, meetings and volunteer opportunities. One of the main challenges was to give each chapter full control over their local membership information. Skvare’s developers created groups and modified the ACL’s (Access Control Lists) to segment the access, editing, and deletion of chapter-specific contacts. Read more about this below. "It’s enabled us to gather attendees and volunteers for our meetings and service events. The biggest benefit so far is probably the ability to allow people to register through the website for our paid events. Before this, we were using individual event pages and each chapter was using a different third-party provider." When Echelon approached Skvare about retooling their website, they were already using CiviCRM. CiviCRM and Drupal are the tools of choice for Skvare, so it was a good fit to adapt their original site to the growing needs of their organization.